For the first time in print, celebrated storytelling phenomenon The Moth presents fifty spellbinding, soul-bearing stories selected from their extensive archive (fifteen-plus years and 10,000-plus stories strong). 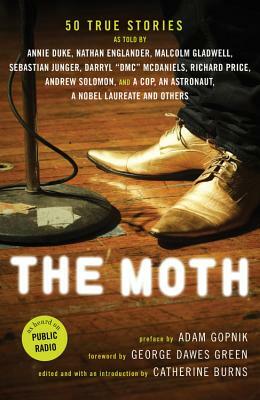 Inspired by friends telling stories on a porch, The Moth was born in small-town Georgia, garnered a cult following in New York City, and then rose to national acclaim with the wildly popular podcast and Peabody Award-winning weekly public radio show The Moth Radio Hour. Stories include: writer Malcolm Gladwell's wedding toast gone horribly awry; legendary rapper Darryl "DMC" McDaniels' obsession with a Sarah McLachlan song; poker champion Annie Duke's two-million-dollar hand; and A. E. Hotchner's death-defying stint in a bullring . . . with his friend Ernest Hemingway. Read about the panic of former Clinton Press Secretary Joe Lockhart when he misses Air Force One after a hard night of drinking in Moscow, and Dr. George Lombardi's fight to save Mother Teresa's life. This will be a beloved read for existing Moth enthusiasts, fans of the featured storytellers, and all who savor well-told, hilarious, and heartbreaking stories. The Moth is an acclaimed not-for-profit organization dedicated to the art and craft of storytelling. It is a celebration of both the raconteur, who breathes fire into true tales of ordinary life, and the storytelling novice, who has lived through something extraordinary and yearns to share it. At the center of each performance is, of course, the story and The Moth's directors work with each storyteller to find, shape and present it. The Moth received the MacArthur Award for Creative and Effective Institutions in January 2012. "When I started to read the new collection 'The Moth: 50 True Stories,' [the storytellers'] distinctive voices turned on my audio button. It felt as if they had channeled these stories to me. "—Elizabeth Taylor, Chicago Tribune "Editor's Choice"